The Swede Bo Hansson is a man of many talents: a guitarist, and a composer of a wide range of music in folk and jazz idioms. Choral music might be a relatively recent departure for him but its roots run deep, back to the days of his childhood when he sang as a treble in his local choir. He has observed that ‘the human voice is the closest you can come to your soul’ and in that search he writes music that demands much of its performers in its sustained intensity of sound, a penchant for a cappella and a fresh way with word-setting even in the most established of texts, as in the darting energy of the Gloria from the Missa brevis. Rupert Gough and his Royal Holloway Choir are no strangers to Hyperion, having previously made waves in music by Baltic composers Miškinis and Dubra. Here’s yet another sign that he’s one of the most exciting choral conductors of his generation. 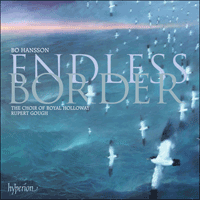 For Bo Hansson the writing of classical choral music has come relatively late in life. His earlier career centred around music in folk and jazz style, both strong elements of Swedish musical culture, but a decision to write more contemporary classical choral music has brought his music to international prominence. His wide-ranging influences from outside the realms of more traditional choral culture, and church music, make for a fresh approach and one shaped by instrumental techniques and a love of melody. Born in Kalmar, he sang as a treble in his local church choir, going on to study guitar at the Royal Academy of Music in Stockholm, graduating in 1978. By 1980 he was teaching guitar and chamber music at Södra Latins Gymnasium in Stockholm, a secondary school specializing in the training of future professional musicians. With the conductor Gary Graden he also developed composition workshops with children. His professional career has been varied and wide-ranging. As a guitarist he often works in collaboration with other artists, particularly the Dutch guitar player Eric Lammers in the ‘Lammers and Hansson Guitar Duo’. He is also interested in combining guitar and voice and for many years was a singer, guitarist and arranger for ‘Skogsfiol och flöjt’ a well-known group in Sweden. For a number of years he wrote choral arrangements of folk and popular songs, often with a role for the guitar. At the age of thirty-five Hansson became increasingly interested in musical composition and took some private lessons from Swedish composer Johan Hammerth. A desire to write in a more contemporary classical style ensued and led to the choral piece Som när handen, which won a major national composing competition in 1993. Since that time he has been regularly commissioned to write new choral works and has developed a close relationship with two choirs associated with Gary Graden, the St Jacob’s Chamber Choir and the Orpheus Vocal Ensemble. Som när handen represents Hansson’s first major choral work. Composed in 1993, it was awarded first prize in the national Swedish composition competition. Hansson approached the piece very much as a personal musical exercise, a working out of harmonic ideas. The resultant colourful harmonies are constructed with particular use of seconds and fourths. The harmonic language emerging from this piece permeates later works and establishes the composer’s distinctive musical voice. Annika Hultman Löfvendahl’s text begins at daybreak and Hansson uses middle C almost like the point on the horizon from where the breaking sun will appear. The sound quickly expands into an exultant C major. Following this, ‘A journey is begun’ with repetitions in all parts like deliberate footsteps. The use of such ostinatos is to become another fingerprint of the composer’s style. To conclude, Hansson recalls the opening ‘As when the day dawns’ with pianissimo unison Cs from all voices. Salve regina was commissioned by the Landesakademie für die musizierende Jugend in Baden-Württemberg and dedicated to the Orpheus Vocal Ensemble. There is a strong sense of plainsong modality from the outset and, as the piece progresses, fragments of chant-like melody are overlaid and manipulated like a musical collage. A fast 5/8 tempo gives way to a more lyrical compound time for ‘mater misericordiae’. The increasing opposition of rhythms lends urgency to the line ‘Ad te clamamus’ before subsiding into a moment of calm. Whilst the first half of the piece only alludes to plainchant (the fast 5/8 repetitions of ‘Salve regina’ in fact bearing the same outline as the Ambrosian chant), at the mid point ‘Eia ergo, advocata nostra’ Hansson introduces an unadorned quotation of the ferial version of the Gregorian chant. A single soprano voice sings the final tender line ‘o pia, o dulcis virgo Maria’ with the lyricism of the plainsong melody enriched with the purity and serenity of sustained C major chords beneath. The combination of rich and unresolved contemporary harmonies, with constant recollections of the plainsong antiphon, serves to create in this piece an atmosphere of prayer spanning the centuries. Then I heard the singing was the result of a commission from Rupert Gough and The Choir of Royal Holloway to set a text by St Bridget of Sweden for the College’s annual carol service. St Bridget (Birgitta Birgersdotter) was born in the fourteenth century to an aristocratic family related to the kings of Sweden, was well travelled and later settled in Rome. Her hundreds of visions mostly concerned reform of the Church, and in many cases Christ and/or Mary gave Birgitta messages to be given to others. Shortly before her death, she described a vision which included a very visual description of the birth of Jesus. The image of the infant Jesus himself emitting light was to influence the way the Nativity was depicted in the Renaissance and Baroque era, painters frequently making this holy light the predominant source of illumination. Hansson takes an unhurried approach to this passage from St Bridget’s Revelations, pausing to reflect on key words using chords resonating with perfect fourths. Halfway through the piece the music changes key for the pivotal moment: ‘suddenly in a moment she gave birth’. From this moment the focus is on ‘light and splendour’ but these same shimmering chords return and hang in the air to bathe the end of the piece in ‘sweetness and beauty’. For as the rain was composed for a festival of contemporary church music in Uppenbarelsekyrkan in Hägersten, Stockholm, in 2009. It was commissioned by the conductor Kerstin Börjesson, along with a new Missa brevis, for the main service in this festival. This choral postlude sets verses from Isaiah which were appointed for that particular Sunday between Epiphany and Lent, and was scored for the musical forces available: the main church choir (in six parts), a youth choir (three female voice parts) and organ. In the first section the ambiguous bitonal writing proves highly evocative with the two choirs echoing each other against the rippling organ accompaniment. For much of the piece the writing is more atonal than in earlier works, particularly in the organ part, and at the conclusion, with its riotous outburst ‘all the trees of the field shall clap their hands’, there is still a conflict between major and minor. In 2000 Hansson again set a poem by Hultman Löfvendahl, Den plats bland träden (The place amongst the trees), this time for the Stockholm Musikgymnasiums Kammarkör. For this recording composer and poet collaborated to revise the work with an English version of the text. Little musical alteration was required and all the elements of word painting are every bit as vivid. The sense of the text can be interpreted fairly freely, ‘like absorbing a modern art painting’, says the composer. Essentially it comments on the speed of modern life and the all-too-transient human interaction that it increasingly affords. This is particularly summoned up by the final lines: ‘Breathlessly we will taste the words that never / Burned on our tongue.’ In this eight-part a cappella work there are elements of imitation, but more important is the creation of vocal textures through the layering of voices and musical fragments. This is very apparent at the beginning for ‘Slowly rises the narrow whirl of longing’. The sound wavers around a central pitch before breaking into a rising melodic figure with upward-inflected fragments emphasizing the word ‘longing’. Later in the work another interesting texture is established for ‘time that spins / All on its distaff’. The undisturbed pulse of repeated cluster chords and the rootless harmony allow time to stand still for a moment before ‘the ocean rises beneath the tempest’. The Missa brevis is the composer’s first setting of a liturgical text. Composed for the same church music festival as For as the rain it employs the same scoring with a main choir of six voices (with subdivisions) placed at the West end of the church alongside the organ together with the addition of a female-voice descant choir in two to three parts situated in a gallery halfway down the church. A fragmented approach is evident right at the start where phrases are cut down into syllabic repetitions that gradually increase in length. The upward-rising ‘Kyrie’ adds a yearning sense to this plaint as does the constant repetition of the ‘Christe eleison’, with the harmonies ever contracting. Alongside, the organ plays an equal role, either developing the choral material (as in the opening) or providing contrasting melodic material (as in the central section of the movement). The Gloria gives the impression of being more strongly rooted in early liturgical form with many lines of the text chanted in a manner akin to plainsong. A more fluid harmonic approach is taken for ‘Benedicimus te’, which is mirrored later in the section for ‘Qui sedes ad dexteram’. At the centre of the movement the magnitude of God is unveiled with powerful towering chords for ‘Domine Deus, Rex caelestis’, which then subside, leaving the descant choir ascending for the phrase ‘Qui tollis peccata mundi’. The conclusion of this movement, with its dancing triple-time rhythms and toccata-style organ writing, conjures up all the liturgical drama of the end of Mass. Hansson’s characteristic chords built on perfect fourths here resonate like a peal of bells. The Sanctus begins as a reverential chant building up through all the voices until it is transformed into a great song of praise in C major, the 6/8 rhythm adding vigour. Against this compound-time backdrop, Hansson introduces a contrasting 3/4 lyrical melody for ‘Pleni sunt caeli’. The ‘Hosanna’ section, like the beginning, builds up from bass to soprano, each voice chanting in different layers. The Benedictus rises seamlessly from the end of this outburst using again the 3/4 melody heard earlier. Here it becomes a five-part canon between all the female voices leading to a more subdued chant of ‘Hosanna in excelsis’ to conclude. The Agnus Dei takes a more atonal approach, weaving a tapestry combining colourful harmonies with more angular melodic writing. Hansson returns to C minor and material from the Kyrie for the end of the Mass, the ‘miserere’ being broken up and slowly recited by all voices until settling onto a final ‘nobis’ almost like a final gasp. For the final ‘Dona nobis pacem’ section a sense of calm is established with more ethereal writing for the upper voices. Many of Hansson’s choral pieces have been inspired by Psalm texts. The way the Psalms relate to our personal experience of faith, with many contrasting emotions and often questioning tones, particularly interests the composer. Psalm 13, Lighten mine eyes, describes the desperation of the psalmist who is questioning how long God will make him suffer at the hands of his enemies. The voice of despair in the slow repetition of ‘How long’ from the lower voices contrasts markedly with the more agonized descending declamation from the upper voices. This playing out of emotions continues until the psalmist asks for enlightenment with the words ‘lighten mine eyes, lest I sleep the sleep of death’, set with four echoing soprano voices. This is a turning point, with lower voices reflecting on the words ‘But I have trusted in thy mercy’. Now a new texture begins rising confidently with soprano and alto cries of ‘my heart shall rejoice in thy salvation’. Hope and faith prevail and there is a very palpable sense of resolution and calm for the concluding line ‘because he hath dealt bountifully with me’, where the two choirs echo each other in an ecstatic and yet quiet song of redemption. The piece was composed for the Maria Magdalena Motet Choir and Ragnar Bohlin. Endless border was written in 2007 for the Europa Cantat Singing Week in Ljubljana, Slovenia, and the German vocal ensemble Singer Pur. For this piece Hansson uses a more expansive vocal canvas to create a large aural spectacle. A semi-chorus of six soloists is surrounded by a rich ten-part chorus and every opportunity is taken to exploit this spread of voices. As in other works, the text reveals itself slowly. Varied vocal techniques are also employed, such as splitting syllables across different voices and spoken vocalizations. The text is a poem written in English by Swedish writer Sun Axelsson, who died shortly after the making of this recording. Hansson was inspired to set this poem for its explorations of temporal boundaries. Bo Hansson, dont la carrière s’est d’abord centrée sur ces deux éléments majeurs de la culture suédoise que sont les styles folk et jazz, est venu relativement tard à l’écriture chorale mais son choix de composer davantage de musique chorale classique contemporaine valut à son œuvre une attention internationale. Ses influences multiples, extérieures à la culture chorale traditionnelle et à la musique liturgique, apportent de la fraîcheur à son approche, façonnée par les techniques instrumentales et l’amour de la mélodie. Né à Kalmar, Hansson fut soprano dans son chœur paroissial avant de partir étudier la guitare à l’Académie royale de musique de Stockholm, dont il fut diplômé en 1978. En 1980, il enseigna la guitare et la musique de chambre à Södra Latins, un établissement secondaire spécialisé dans la formation de futurs musiciens professionnels. Grâce au chef d’orchestre Gary Graden, il développa aussi des ateliers de composition avec des enfants. Sa carrière fut variée et d’envergure. En tant que guitariste, il collabora souvent avec d’autres artistes, notamment le guitariste hollandais Eric Lammers, avec qui il forma le «Lammers and Hansson Guitar Duo». S’intéressant également à la combinaison guitare/voix, il fut, pendant des années, le chanteur-guitariste-arrangeur de «Skogsfiol och flöjt», un célèbre groupe suédois. À trente-cinq ans, après plusieurs années passées à écrire quantité d’arrangements choraux de chants traditionnels et populaires où la guitare avait souvent sa place, il s’attacha de plus en plus à la composition et prit des leçons particulières avec le suédois Johann Hammerth. De là naquit son désir d’un style classique davantage contemporain, qui déboucha sur la page chorale Som när handen, lauréate d’un grand concours national de composition en 1993. Depuis, on lui commande régulièrement des œuvres chorales et il a développé une étroite collaboration avec deux chœurs liés à Gary Graden, le St Jacob’s Chamber Choir et l’Orpheus Vocal Ensemble. Écrite en 1993, Som när handen, sa première grande œuvre chorale, remporta, en Suède, le premier prix du concours national de composition. Hansson l’aborda comme un exercice musical personnel, une combinaison d’idées harmoniques. Les harmonies colorées qui en résultèrent font un usage particulier des secondes et des quartes. De cette pièce émerge un langage harmonique qui imprégnera d’autres œuvres, fondant le style musical singulier de ce compositeur. Le texte d’Annika Hultman Löfvendahl commence au point du jour et Hansson fait presque de l’ut central le point de l’horizon d’où l’aurore apparaîtra. Rapidement, le son se développe en un exultant ut majeur puis «Un voyage est entrepris», avec des répétitions à toutes les parties, comme des bruits de pas délibérés. L’emploi de tels ostinatos deviendra une autre griffe de Hansson, qui termine en rappelant l’ouverture «Comme quand le jour se lève», avec des ut pianissimo à toutes les voix, à l’unisson. Commande de la Landesakademie für die musizierende Jugend in Baden-Württemberg, le Salve regina, dédié à l’Orpheus Vocal Ensemble, affiche d’emblée une puissante modalité grégorienne et, au fil de l’œuvre, des fragments de mélodie façon plain-chant sont recouverts et manipulés comme un collage musical. Un tempo rapide à 5/8 cède la place à une mesure composée, plus lyrique, pour «mater misericordiae». L’opposition croissante des rythmes confère une certaine urgence au verset «Ad te clamamus» avant de s’effacer en un moment de calme. Alors que la première moitié de l’œuvre ne faisait qu’allusion au plain-chant (les rapides répétitions à 5/8 de «Salve regina» présentent en réalité le même contour que le chant ambrosien), c’est là, pour «Eia ergo, advocata nostra», que Hansson introduit une citation, dépouillée, de la version fériale du chant grégorien. Une voix de soprano chante le tendre «o pia, o dulcis virgo Maria» final avec le lyrisme de la mélodie en plain-chant enrichi de la pureté et de la sérénité des accords tenus en ut majeur, en dessous. La combinaison de riches harmonies contemporaines, non résolues, avec de constantes réminiscences de l’antienne grégorienne concourt à créer une atmosphère de prière par-delà les siècles. Then I heard the singing est le fruit d’une commande de Rupert Gough et du Choir of Royal Holloway désireux de faire mettre en musique un texte de Sainte Brigitte de Suède pour le service de carols annuel du College. Sainte Brigitte (Birgitta Birgersdotter), née au XIVe siècle dans une famille aristocratique parente des rois de Suède, voyagea beaucoup avant de s’établir à Rome. Ses centaines de visions concernèrent surtout la réforme de l’Église et, très souvent, le Christ et/ou Marie lui confièrent des messages à transmettre à d’autres. Peu avant de mourir, elle dépeignit une vision intégrant une description très visuelle de la naissance de Jésus. Cette image de l’enfant Jésus émettant de la lumière influencera la représentation de la Nativité par les peintres renaissants et baroques qui faisaient souvent de cette lumière sainte la principale source d’illumination. Hansson aborde sereinement cet épisode des Révélations de Sainte Brigitte, avec des pauses pour faire honneur aux mots clés par le biais d’accords résonnant de quartes justes. À mi-chemin de l’œuvre, au moment charnière («soudain, en un instant, elle enfanta»), la musique change de tonalité: dès lors, l’accent est mis sur la «lumière et la splendeur», mais les mêmes accords chatoyants reviennent, suspendus en l’air, pour baigner la fin de la pièce «de douceur et [de] beauté». Pour un festival de musique liturgique contemporaine organisé à Uppenbarelsekyrkan in Hägersten (Stockholm, 2009), le chef d’orchestre Kerstin Börjesson commanda à Hansson une nouvelle Missa brevis destinée à l’office principal, mais aussi For as the rain, un postlude choral écrit pour les forces alors disponibles—à savoir le chœur principal de l’église (à six parties), un chœur d’enfants (trois parties vocales féminines) et un orgue—et exprimant en musique des versets d’Isaïe dédiés au dimanche entre l’Épiphanie et le Carême. Dans la première section, l’écriture bitonale ambiguë s’avère des plus évocatrices, les deux chœurs se faisant écho sur fond d’accompagnement organistique ondoyant. Sinon, l’écriture est, pour l’essentiel, plus atonale que dans les œuvres antérieures, surtout dans la partie d’orgue, et la fin—avec son déchaînement à «tous les arbres de la campagne battront des mains»—demeure marquée par un conflit entre majeur et mineur. En 2000, Hansson mit en musique un autre poème de Hultman Löfvendahl, Den plats bland träden (The place among the trees [L’endroit parmi les arbres]), pour le Stockholm Musikgymnasiums Kammarkör. Pour le présent enregistrement, le compositeur et le poète ont collaboré à la révision de l’œuvre en prenant en compte une version anglaise du texte. Cette révision nécessita peu de modifications musicales et les éléments de figuralisme ne perdent rien de leur force. Le texte peut être interprété assez librement, «comme en assimilant un tableau d’art contemporain», déclare Hansson. Sur le fond, il dit la trépidance de la vie moderne et l’interaction humaine toujours plus fugace qu’elle autorise, comme le rappellent tout particulièrement les derniers vers: «En grande hâte, nous goûterons les mots qui jamais / Ne brûlèrent sur notre langue.» Cette œuvre a cappella à huit parties présente des éléments d’imitation, mais ce qui prime, c’est l’élaboration de textures vocales via l’étagement de voix et de fragments musicaux, comme on l’entend très clairement au début, à «Lentement s’élève le tourbillon resserré de l’aspiration». Le son oscille autour d’une hauteur centrale avant une figure mélodique ascendante, avec des fragments d’inflexion ascendante visant à accentuer l’«aspiration». Plus tard, une autre texture intéressante vient marquer «le temps qui file / Sur sa quenouille». Le rythme tranquille d’accords en clusters répétés et l’harmonie instable donnent du temps pour s’apaiser un moment, avant que «l’océan se soulève sous la tempête». Avec la Missa brevis, Hansson signa sa première mise en musique d’un texte liturgique. Écrite pour le même festival que For as the rain, elle requiert les mêmes forces: un chœur principal de six voix (avec subdivisions) placé à l’extrémité ouest de l’église, à côté de l’orgue, plus un chœur féminin de déchant, à deux ou trois parties, installé dans une galerie à mi-hauteur. L’approche fragmentée est d’emblée flagrante, les phrases étant découpées en répétitions syllabiques de plus en plus longues. Cette plainte se teinte d’un ardent désir grâce au «Kyrie» ascendant et à l’implacable répétition du «Christe eleison», avec les harmonies en constante contraction. Parallèlement, l’orgue fait jeu égal soit en développant le matériau choral (comme dans l’ouverture) soit en fournissant un matériel mélodique contrastif (comme dans la section centrale du mouvement). Le Gloria donne l’impression d’être plus fermement ancré dans une forme liturgique ancienne, de nombreux versets étant exécutés d’une manière apparentée au plain-chant. Pour «Benedicimus te», une approche harmonique fluide est adoptée, que reflétera «Qui sedes ad dexteram». Au centre du mouvement, l’ampleur de Dieu est révélée par de puissants accords dominateurs à «Domine Deus, Rex caelestis», qui s’effacent ensuite, laissant le chœur de déchant monter pour «Qui tollis peccata mundi». La conclusion de ce mouvement, aux dansants rythmes ternaires et à l’écriture organistique en style de toccata, fait sourdre tout le drame liturgique de la fin de la messe. Les accords typiques de Hansson, bâtis de quartes justes, résonnent ici tel un appel de cloches. Le Sanctus s’ouvre sur un plain-chant révérentiel qui se développe à travers toutes les voix avant de se muer en un grand chant de louange en ut majeur, le rythme à 6/8 apportant de la vigueur. Sur ce fond en mesures composées, Hansson introduit une contrastive mélodie lyrique à 3/4 pour «Pleni sunt caeli». Comme le début, l’«Hosanna» chemine de la basse au soprano, chaque voix psalmodiant dans des strates différentes. Partant de la fin de cette explosion, le Benedictus s’élève sans heurt en réutilisant la mélodie à 3/4, qui se fait ici canon à cinq parties entre toutes les voix féminines pour aboutir, en conclusion, à une psalmodie davantage contenue des mots «Hosanna in excelsis». L’Agnus Dei, d’approche plus atonale, tisse une tapisserie mêlant harmonies colorées et écriture mélodique plus hachée. Pour la fin de la messe, Hansson retrouve ut mineur et le matériau du Kyrie. Le «miserere» est morcelé et lentement récité par toutes les voix avant un ultime «nobis», presque comme un dernier soupir. Pour le «Dona nobis pacem» final, un sentiment de calme est obtenu en éthérant l’écriture des voix supérieures. Les textes psalmiques inspirèrent maintes pièces chorales à Hansson, tout particulièrement attiré par la manière dont les psaumes se rattachent à notre expérience personnelle de la foi, avec quantité d’émotions contrastées et des tons souvent interrogateurs. Le psaume 13, Lighten mine eyes, dépeint la désespérance du psalmiste, qui se demande combien de temps Dieu le fera souffrir aux mains de ses ennemis. La voix du désespoir, perceptible dans la lente répétition de «Combien de temps», aux voix inférieures, offre un contraste marqué avec la déclamation descendante, plus déchirante, aux voix supérieures. Ce jeu des émotions se poursuit jusqu’au moment où le psalmiste implore un éclaircissement avec les mots «donne à mes yeux la clarté, afin que je ne m’endorme pas du sommeil de la mort», destinés à quatre voix de soprano se faisant écho. Tournant de l’œuvre, les voix inférieures méditent sur «Mais j’ai eu confiance en ta miséricorde». Une nouvelle texture commence alors à s’élever, confiante, avec les cris des sopranos et des altos: «mon cœur se réjouira de ton salut». Espérance et foi prévalent et un sentiment de résolution et de calme règne, fort palpable, sur le verset conclusif, «car il m’a traité avec munificence», où les deux chœurs se font écho dans un chant de rédemption extatique mais paisible. Cette œuvre fut composée pour le Maria Magdalena Motet Choir et Ragnar Bohlin. Endless border fut composé en 2007 pour l’Europa Cantat Singing Week de Ljubljana, en Slovénie, et l’ensemble vocal allemand Singer Pur. Hansson y utilise un canevas vocal davantage expansif pour obtenir une superproduction sonore. Un demi-chœur de six solistes est entouré d’un riche chœur à dix parties et cette ampleur vocale est exploitée à la moindre occasion. Comme ailleurs, le texte se dévoile lentement. Des techniques vocales variées sont également utilisées, comme la scission des syllabes via différentes voix et des vocalisations parlées. Le texte—un poème en anglais de la Suèdoise Sun Axelsson, morte peu après la réalisation de cet enregistrement—inspira Hansson par son exploration multiple des limites temporelles. Bo Hansson hat mit dem Komponieren von klassischer Chormusik erst relativ spät begonnen. Zunächst befasste er sich mit Volksmusik und Jazz, beides wichtige Elemente der schwedischen Musikkultur, doch führte der später gefasste Entschluss, sich verstärkt dem Komponieren zeitgenössischer klassischer Chormusik zu widmen, seine Musik ins internationale Rampenlicht. Durch die breite Fächerung seiner Inspirationsquellen außerhalb des Gebiets der traditionellen Chorkultur und Kirchenmusik ergibt sich in seinen Werken ein ganz neuer Ansatz, der von instrumentalen Techniken und einer Liebe zur Melodie geprägt ist. Hansson stammt aus Kalmar, wo er als Knabensopran im Kirchenchor sang, bevor er an der Königlich Schwedischen Musikakademie in Stockholm Gitarre studierte und 1978 seinen Abschluss machte. Ab 1980 unterrichtete er Gitarre und Kammermusik am Södra Latins Gymnasium in Stockholm, das auf die professionelle Musikausbildung vorbereitet. Auf die Anregung des Dirigenten Gary Graden hin entwickelte er zudem Kompositionsworkshops mit Kindern. Seine professionelle Karriere hat einen vielfältigen und abwechslungsreichen Verlauf genommen. Als Gitarrist arbeitet er oft mit anderen Künstlern zusammen, insbesondere dem niederländischen Gitarristen Eric Lammers unter dem Namen „Lammers and Hansson Guitar Duo“. Er interessiert sich ebenso für die Kombination Gitarre und Singstimme und hat viele Jahre lang als Sänger, Gitarrist und Arrangeur des in Schweden berühmten Ensembles „Skogsfiol och flöjt“ gewirkt. Über mehrere Jahre hinweg schrieb er zahlreiche Chorarrangements von Volksliedern, in denen auch oft ein Gitarrenpart einkomponiert war. Ab dem Alter von 35 Jahren interessierte Hansson sich zunehmend für Komposition und nahm Privatunterricht bei dem schwedischen Komponisten Johan Hammerth. Der Wunsch, in einem zeitgenössischen klassischen Stil zu schreiben, führte zu dem Chorstück Som när handen, das ihn 1993 zum Preisträger in einem wichtigen schwedischen Kompositionswettbewerb machte. Seitdem erhält er regelmäßig Kompositionsaufträge für neue Chorwerke und hat mit den beiden Chören, die von Gary Graden geleitet werden, dem St Jacobs Kammarkör und dem Orpheus Vocal Ensemble, eine enge Beziehung aufgebaut. Som när handen ist Hanssons erstes großes Chorwerk. Es entstand im Jahre 1993 und wurde mit dem ersten Preis des Nationalen Schwedischen Kompositionswettbewerb ausgezeichnet. Hansson behandelte dieses Stück als persönliche musikalische Übung, als ein Ausarbeiten von harmonischen Ideen. Die daraus resultierenden farbenprächtigen Harmonien sind besonders reich an Sekunden und Quarten. Der harmonische Ausdruck, der aus diesem Stück hervorgeht, zieht sich auch durch spätere Werke und bildet die charakteristische musikalische Stimme des Komponisten. Der Text von Annika Hultman Löfvendahl beginnt bei Tagesanbruch und Hansson benützt das eingestrichene C sozusagen als den Punkt am Horizont, an dem die Sonne aufgehen wird. Der Klang dehnt sich schnell in ein jubelndes C-Dur aus. Darauf erklingt „Eine Reise ist begonnen“, wobei Wiederholungen in allen Stimmen wie absichtliche Fußstapfen klingen. Der Einsatz solcher Ostinati stellt sich später ebenfalls als ein Charakteristikum des Komponisten heraus. Gegen Ende erinnert Hansson an den Anfang, „Wenn der Tag anbricht“, mit den Pianissimo-Cs aller Stimmen im Unisono. Salve regina war ein Auftragswerk für die Landesakademie für die musizierende Jugend in Baden-Württemberg und ist dem Orpheus Vocal Ensemble gewidmet. Von Anfang an mutet das Werk sehr modal an und im Laufe des Stücks werden Fragmente einer Cantus-planus-artigen Melodie wie eine musikalische Collage überdeckt und manipuliert. Ein zügiges Tempo in 5/8 weicht einem eher lyrischen zusammengesetzten Taktmaß bei „mater misericordiae“. Der zunehmende Gegensatz zwischen den Rhythmen verleiht der Zeile „Ad te clamamus“ besondere Dringlichkeit, bevor die Musik wieder in einen Augenblick der Ruhe hinabsinkt. Während die erste Hälfte des Stücks nur auf Cantus planus anspielt (wobei die schnellen 5/8-Wiederholungen von „Salve regina“ sogar dieselben Konturen haben wie der Ambrosianische Gesang), fügt Hansson an dieser Stelle bei „Eia ergo, advocata nostra“ ein unverziertes Zitat der Alltagsversion des Gregorianischen Chorals ein. Eine einzelne Sopranstimme singt die letzte sanfte Zeile „o pia, o dulcis virgo Maria“ mit der Lyrik einer Cantus-planus-Melodie, die durch die Reinheit und Ruhe der ausgehaltenen, darunter liegenden C-Dur-Akkorde angereichert wird. Die Kombination von reichhaltigen und unaufgelösten zeitgenössischen Harmonien mit stetigen Erinnerungen an Cantus-planus-Antiphon erzeugt in diesem Stück eine jahrhunderteübergreifende Atmosphäre des Betens. Then I heard the singing [Dann hörte ich den Gesang] war das Ergebnis eines Auftrags von Rupert Gough und dem Choir of Royal Holloway, bei dem ein Text der Heiligen Birgitta von Schweden für den alljährlichen Weihnachtslieder-Gottesdienst des Colleges vertont werden sollte. Die Heilige Birgitta (Birgitta Birgersdotter) stammte aus einer aristokratischen Familie, die mit dem schwedischen Königshaus verwandt war, und lebte im 14. Jahrhundert. Sie reiste viel herum und ließ sich schließlich in Rom nieder. Ihre zahlreichen Visionen bezogen sich hauptsächlich auf Kirchenreformen und in vielen Fällen erhielt sie von Christus, bzw. Maria Nachrichten, die sie anderen weitergeben sollte. Kurz vor ihrem Tod beschrieb sie eine Vision, wobei sie unter anderem die Geburt Jesu sehr bildlich darstellte. Das Bild des Jesuskindes, das selbst Licht ausstrahlt, sollte ein wichtiger Einfluss auf die Maler der Renaissance und des Barock werden, die die Geburt Christi darstellten und bei denen dieses heilige Licht oft die Hauptbeleuchtung der Bilder war. Hansson nähert sich dieser Passage aus den Offenbarungen Birgittas ohne jede Hast und hält mehrmals inne, um über Schlüsselwörter zu reflektieren, zu denen Akkorde mit reinen Quarten erklingen. Etwa in der Mitte des Stücks wechselt die Musik bei einem zentralen Moment die Tonart: „suddenly in a moment she gave birth“ [plötzlich gebar sie in einem Augenblick ihren eigenen Sohn]. Von diesem Augenblick an liegt der Schwerpunkt auf „light and splendour“ [Licht und Glanz], doch kehren dieselben schillernden Akkorde zurück und hängen in der Luft, um das Ende des Stücks in „sweetness and beauty“ [Lieblichkeit und Schönheit] zu tauchen. For as the rain [Denn gleichwie der Regen] entstand 2009 für ein Festival zeitgenössischer Kirchenmusik in der Uppenbarelsekyrkan in Hägersten / Stockholm und war zusammen mit einer neuen Missa brevis für den Hauptgottesdienst dieses Festivals von der Dirigentin Kerstin Börjesson in Auftrag gegeben worden. In diesem Chor-Nachspiel sind Jesaja-Verse vertont, die für den entsprechenden Sonntag zwischen Epiphanias und Quadragesima bestimmt sind. Das Werk ist für die Besetzung angelegt, die seinerzeit zur Verfügung stand, nämlich für den Kirchenchor (in sechs Stimmen), einen Jugendchor (drei Frauenstimmen) und Orgel. Im ersten Abschnitt erweist sich die mehrdeutige bitonale Struktur als besonders wirkungsvoll, wenn die beiden Chöre sich gegenseitig wiederholen und dagegen die kräuselnde Orgelbegleitung gesetzt ist. Ein großer Teil des Stücks ist atonaler gestaltet als frühere Werke, insbesondere die Orgelbegleitung und das Ende, wenn bei „all the trees of the field shall clap their hands“ [und alle Bäume auf dem Felde sollen mit den Händen klatschen] ein tobender Ausbruch erklingt und immer noch ein Konflikt zwischen Dur und Moll besteht. Im Jahr 2000 vertonte Hansson ein weiteres Gedicht von Hultman Löfvendahl: Den plats bland träden, bzw. The place amongst the trees [Der Ort bei den Bäumen] für den Kammerchor des Stockholmer Musikgymnasiums. Für die vorliegende Aufnahme bearbeiteten der Komponist und die Dichterin das Werk und erstellten eine Version mit englischem Text. Musikalisch mussten nur wenige Änderungen vorgenommen werden und die wortmalerischen Elemente sind ebenso lebendig wie im Original. Der Textsinn kann recht frei interpretiert werden, „wie wenn man ein Bild der modernen Malerei absorbiert“, so der Komponist. Im Wesentlichen wird das Tempo des modernen Lebens kommentiert sowie die allzu vergängliche menschliche Interaktion, die das Leben heutzutage mit sich bringt. Besonders kommt dies in den letzten Zeilen zum Ausdruck: „Breathlessly we will taste the words that never / Burned on our tongue“ [Atemlos schmecken wir die Worte, die uns nie / auf der Zunge brannten]. In diesem achtstimmigen A-cappella-Werk finden sich Elemente der Imitation, doch ist das Entstehen vokaler Texturen durch musikalische Fragmente und das Anordnen der Stimmen in mehreren Lagen noch wichtiger. Es kommt dies besonders deutlich zu Beginn bei „Slowly rises the narrow whirl of longing“ [Langsam erhebt sich der schmale Wirbel der Sehnsucht] zum Ausdruck. Der Klang schwebt um eine zentrale Tonhöhe herum, bevor eine aufsteigende melodische Figur mit aufwärts gerichteten Fragmenten erklingt, die das Wort „longing“ [Sehnsucht] betonen. Später ergibt sich bei „time that spins / All on its distaff“ [Zeit, die sich schnell dreht / um ihren Rocken] eine weitere interessante Textur. Der ungestörte Puls wiederholter Cluster-Akkorde und wurzelloser Harmonie lässt einen kurzen Stillstand der Zeit zu, bevor „the ocean rises beneath the tempest“ [der Ozean erhebt sich unter dem Sturm]. Die Missa brevis ist Hanssons erste Vertonung eines liturgischen Texts. Das Werk entstand für dasselbe Kirchenmusikfestival wie For as the rain und hat daher dieselbe Anlage: der Hauptchor zu sechs Stimmen (die wiederum unterteilt sind) ist an der Westseite der Kirche bei der Orgel aufgestellt, während ein zwei- bis dreistimmiger Frauen-Diskantchor von einer Empore in der Mitte der Kirche aus singt. Der fragmentarische Ansatz des Werks ist von Anfang an deutlich, wo die Phrasen auf syllabische Wiederholungen reduziert sind, die allmählich ausgedehnt werden. Das aufsteigende „Kyrie“, ebenso wie die stetige Wiederholung des „Christe eleison“, verleiht der Klage eine sehnsüchtige Note, wobei die Harmonien immer mehr zusammenschrumpfen. Dabei spielt die Orgel eine gleichberechtigte Rolle, indem sie das Chormaterial entweder weiterentwickelt (wie am Anfang) oder kontrastierendes melodisches Material einführt (wie im Mittelteil des Satzes). Das Gloria scheint stärker in der alten liturgischen Form verwurzelt zu sein, da ein Großteil des Texts in der Art des Cantus planus gesungen wird. Im „Benedicimus te“ findet sich ein flüssigerer harmonischer Ansatz, was später in dem Satz bei „Qui sedes ad dexteram“ gespiegelt wird. In der Mitte des Satzes wird die Größe Gottes mit kraftvoll emporragenden Akkorden bei „Domine Deus, Rex caelestis“ dargestellt, die dann einsinken und den Diskantchor zurücklassen, der bei „Qui tollis peccata mundi“ eine aufsteigende Phrase zu singen hat. Am Schluss dieses Satzes erklingen tanzende Dreierrhythmen und ein Orgelsatz im Toccatenstil, womit die liturgische Dramatik des Endes der Messe dargestellt wird. Hanssons charakteristische Akkorde, die auf reinen Quarten aufgebaut sind, hallen hier wie Glockenläuten nach. Das Sanctus beginnt als ehrerbietiger Gesang, der sich durch alle Stimmen zu einem großartigen Lobgesang in C-Dur steigert, dem der 6/8-Rhythmus noch weiteren Nachdruck verleiht. Gegen diese zusammengesetzte Taktart führt Hansson eine kontrastierende lyrische Melodie in 3/4 zu „Pleni sunt caeli“ ein. Der „Hosanna“-Teil baut sich, ähnlich wie der Anfang, vom Bass bis zum Sopran auf, wobei jede Stimme in verschiedenen Lagen singt. Das Benedictus steigt nahtlos vom Ende dieses Ausbruchs aus auf und verwendet dabei die bereits bekannte 3/4-Melodie. Hier wird sie in einen fünfstimmigen Kanon zwischen allen Frauenstimmen umgewandelt und führt zu einem eher gedämpften Gesang zum Abschluss: „Hosanna in excelsis“. Das Agnus Dei ist eher atonal gehalten und es wird hier ein Klangteppich mit bunten Harmonien und kantigen Melodien gewebt. Am Ende der Messe kehrt Hansson zu c-Moll und dem Material des Kyrie zurück. Das „miserere“ ist aufgeteilt und wird langsam von allen Stimmen rezitiert, bis sie sich, als ob sie zum letzten Mal Luft holten, auf dem letzten „nobis“ treffen. Im letzten „Dona nobis pacem“ stellt sich durch einen eher ätherischen Satz in den Oberstimmen eine ruhigere Atmosphäre ein. Die Inspirationsquelle vieler Chorwerke Hanssons sind Psalmtexte. Von besonderem Interesse für den Komponisten ist die Art und Weise, wie in Psalmen die persönliche Glaubenserfahrung ausgedrückt wird, wobei viele unterschiedliche Emotionen und auch oft fragende Töne zum Ausdruck kommen. Psalm 13, Lighten mine eyes [Erleuchte meine Augen], beschreibt die Niedergeschlagenheit des Psalmisten, der Gott fragt, wie lang er noch unter seinen Feinden leiden muss. Die Verzweiflung in der langsamen Wiederholung der Worte „How long“ [Wie lang] in den tieferen Stimmen ist deutlich von der gequälteren absteigenden Deklamation der oberen Stimmen abgesetzt. Diese Darstellung der Emotionen wird fortgesetzt bis der Psalmist mit den Worten „lighten mine eyes, lest I sleep the sleep of death“ [Erleuchte meine Augen, dass ich nicht dem Tod entschlafe], die für vier einander imitierende Sopranstimmen gesetzt sind, um Linderung bittet. Dies ist ein Wendepunkt, bei dem die tieferen Stimmen über die Worte „But I have trusted in thy mercy“ [Ich hoffe aber darauf, dass du so gnädig bist] reflektieren. Nun beginnt ein zuversichtlich gestimmter neuer Abschnitt, in dem Sopran- und Altstimmen rufen: „my heart shall rejoice in thy salvation“ [mein Herz freut sich, dass du so gerne hilfst]. Es herrschen hier Hoffnung und Glaube vor und in der letzten Zeile, „because he hath dealt bountifully with me“ [dass er so wohl an mir tut], imitieren sich die beiden Chöre gegenseitig in einem ekstatischen und doch ruhigen Lied der Erlösung. Dieses Stück wurde für den Maria Magdalena Motettkör und Ragnar Bohlin komponiert. Endless border [Endlose Grenze] entstand 2007 für die Europa Cantat Gesangswoche in Ljubljana und das deutsche Vokalensemble Singer Pur. Dieses Stück legt Hansson deutlich weiträumiger an, um ein großes Klang-Spektakel zu erzeugen. Ein kleines Ensemble von sechs Solisten wird von einem reichhaltigen zehnstimmigen Chor umgeben und er lässt keine Gelegenheit aus, diese Bandbreite von Stimmen voll auszunutzen. Ebenso wie in anderen Werken kommt auch hier der Text erst allmählich zum Vorschein. Zudem werden unterschiedliche Vokaltechniken eingesetzt, wie etwa das Verteilen von Silben auf verschiedene Stimmen sowie gesprochene Vokalisen. Der Text ist ein Gedicht in englischer Sprache von der schwedischen Autorin Sun Axelsson. Hansson war an diesem Gedicht insbesondere aufgrund seines Experimentierens mit zeitlichen Grenzen interessiert.